The ocean is full of unbelievably strange sea creatures, some of which are so freakish you could never imagine they would exist. Most of the Earth’s surface is covered in water, and there are more creatures here than any where else in the world. The deep reaches of the ocean are so dark, and alien to our own world’s that some of the monsters found down there are completely incomparable to ourselves. This is a list of 10 unbelievably strange sea creatures. 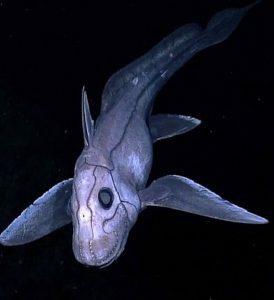 Chimaeras live deep in the ocean, and are can be found down to 2,600 m or 8400 feet. The have long, soft bodies, and with a large head, and one gill-opening. They are huge creatures, no shorter than some sharks, and grow up to 4.9 ft in length. Their skin is smooth, and covered in scales, their skeletons are made out of cartilage, like our human ears. They can change colour from black to greyish brown. They also have a venomous spine as a defence mechanism. The chimaera have three pairs of large, grinding tooth plates. They look like terrifying monsters so it’s good to know they can only be found deep in the ocean, very few ever go shallower than 200m deep. 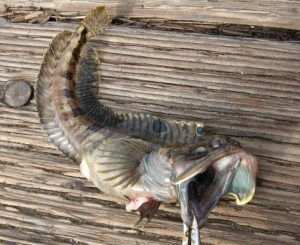 The sarcastic Fringehead is an aggressive, territorial fish. They are one of the strangest sea creatures in the known world for multiple reasons. Partly because of their freakish appearance, and also because of their weird way of fighting other members of the species. When two Fringeheads fight, they open their mouths, and then press them together to see who is bigger. The bigger one is the one who gains dominance after this. They are small scaleless creatures, and can be found hinding under rocks, or in crevices guarding eggs. They are found from 3 to 72 m, in the pacific coast. 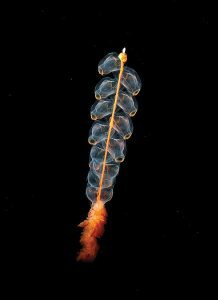 This bright fish is a species of pelagic siphonophore. It lives deep in the Arctic ocean. This is a mysterious creature, and a lot areas to do with it still remain unstudied. Amazingly this fish isn’t actually one creature, but a colony of zooids living together. Colonial animals like this serve to increase the defence of the members, and help to attack bigger prey. This animal captures food by extending it’s tentacles, and catching it. The tentacles creating a net about 30-50 cm from the body stem. It’s uncertain what this animal eats but, larger crustaceans like decapods, and krill is a good guess. The average snail shell is pretty weak, and doesn’t take much to break, the armoured snails aren’t like any other snails. Also known as the Scaly-foot gastropod, these strange sea creatures have a multi-layered shell unlike any other armour. It was found 2,4000 m deep, in the Indian ocean. 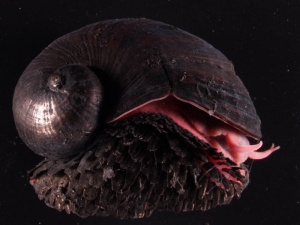 This snail is considered by scientists to be one of the strangest deep sea creatures ever found. It’s the only known extant animal that incorporates iron sulfide into it’s skeleton, and has proportionately giant heart which makes up 4% of it’s body volume. The shell has three layers, the innermost layer is made of aragonite, the middle is similar to the organic periostracum found in other gastropods, and the outer layer consists of Iron sulfide. 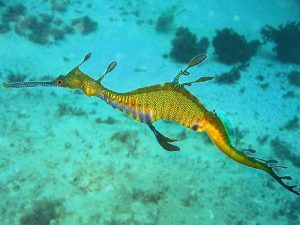 The weedy seadragon is a marine animal related to the seahorse. Fully grown weedy seadragons are reddish with yellow and purple markings. Their leaf like appearance is perfect for camouflage, and their other defence mechanism are the short spines spines protruding from it’s body. They live in coastal waters no higher than 50 m deep. They are naturally slow creatures and can’t stop moving because they lack prehensile tail which would allow them to stop in one position. They have to rely on their ability to camouflage in order to stay safe from danger. The strange sea creatures aren’t huge and generally only grow to around 45 cm long. The football fish is the first deep-sea angler ever found. It can now be found in tropical, and sub-tropical waters of several different oceans, including the Atlantic, Pacific, and Indian oceans. 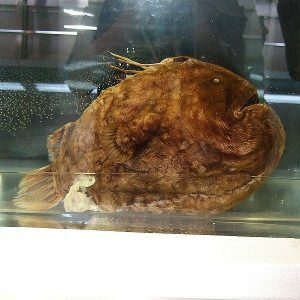 The football fish was first discovered by a deep-sea fisherman looking for flounder. The creature are slow and mainly just stay where they are, and wait for their prey to come to down. The females of this species are absolutely huge compared to the males, females can grow bigger than 60 cm long, whereas males don’t get any bigger than 1.5 inches. Football fish fall prey to sperm whales, and other football fish. 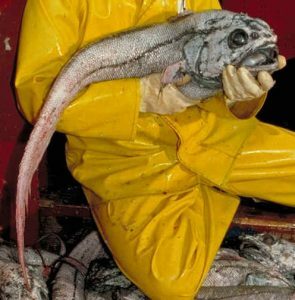 Giant grenadiers are very big rattail, and the only member of the genus albatrossia, found in the north Pacific from northern Japan to the Okhotsk and Bering seas, east to the gulf of Alaska, and south to northern Baja California. These terrifying and strange sea creatures are found in the ocean, in waters both shallow and deep. They swim between 140 m, and 3,500 m deep. It grows up to 2.1 m. They swim slowly looking for prey, and and even eating live carcasses. They have an overpowering odour due to the large amounts of TMAO in it’s body. The giant grenadiers live to old age of 56 which is allows it to outlive most of the fish in the ocean. 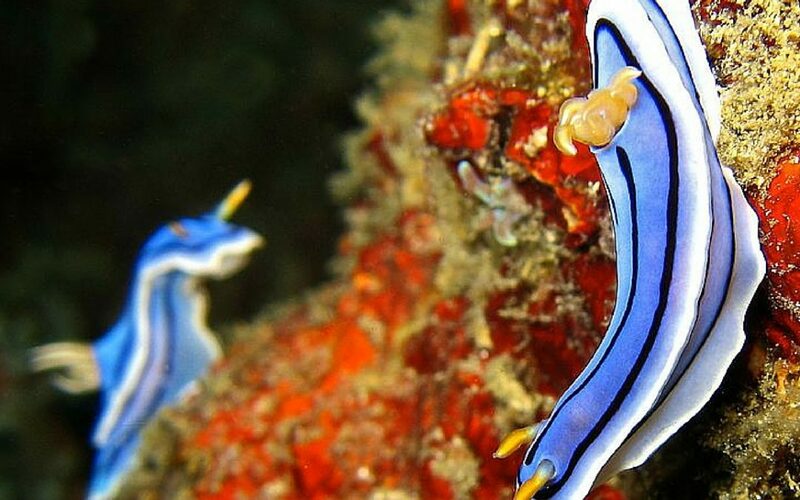 3,000 known species of Nudibranch exist, and their some of the colourful animals on the planet. It’s uncommon to see any creature with such a diverse range of colours. There soft bodied, marine gastropod molluscs. 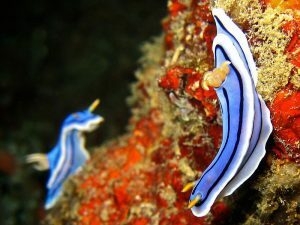 Nudibranch live in seas all over the world, and live at almost all levels of sea waters. The lowest a Nudibranch has been discovered is at 8,500 ft. Their eyes are basic and can only see the difference between light and dark. Nudribranch range from tiny to kind of big, the smallest are 0.16 inches, and the largest can be 23 inches. Their name comes from the Latin nudus, which means naked, and the Greek word brankhia, which means gills. They are named this because the dorids breathe through a naked gill. It’s body is in the shape of a hatchet, which is where it gets it name from. It lives all over the world, and generally stays between 600 and 4,500 ft. 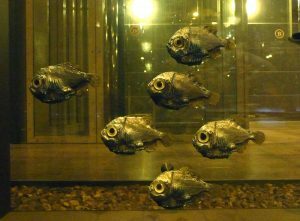 There are 45 different types of hatchet fish but none of them grow any bigger than six inches. They vary in colour from green, to dark brown, to silver. The fish have cleverly evolved to trick predators into missing them by blending in with the rest of the water. Using counter-illumination they match light intensity with the light penetrating the water from above. Like most strange deep sea creatures, there are many aspects that have never been studied. Very little is known about their mating habits, and their life cycle is mostly a mystery. The firefly squid is called such, because it lights up, in a way similar to a firefly. 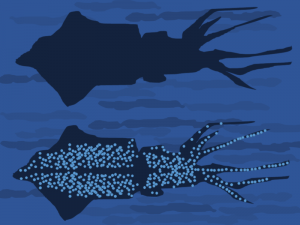 It’s a bioluminescent squid found in the western pacific ocean as deep as 366 m, and as shallow as 183 m. It’s many tentacles produce light which attracts smaller fish for the squid to eat. Each of it’s tentacles have three organs, near it’s end with the ability to produce light. Like the Hatchetfish, the squid can change it’s brightness to blend in with it’s surroundings, and become invisible to predators. The Firefly squid changes it’s location based on night and day, in the day time it spends it’s time deep in the ocean but then relocates to the surface at night.